20,000! Bro, that’s a whole ‘nother record that won’t soon be broken. 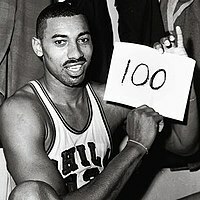 So while people are celebrating the 100 points, let us remember that Wilt was more than a basketball player…he was also a playa! Wilt died at the age of 63 (RIP), alone, unmarried, unengaged, and a self proclaimed bachelor for life. In the end, we all die alone (think about it). Back to basketball though, is there anybody in the NBA that can get to 100? Kobe, LeBron, KD? I don’t think so, but tell me what you guys think by commenting below (not that I really care about what you think or anything, but I wanna make fun of somebody). So today, I salute you Wilt, for owning 2 of the most impressive records on the planet. If you’re gonna be the best, be the best at EVERYTHING you do, I DONE SAID IT!